The question is not: "Do you support horse slaughter?" The question is: "Do you support the cruel, terrifying transport for days without food and water in their journey to death?" The question is: "Do you support the torture and abuse of the killer chutes, even for crippled horses, pregnant mares, wild horses, protective mares with foals by their sides?" The question is: "Do you support the horse slaughter factories that lie to their consumers about the many chemicals that taint the horse meat, and call it Organic?" The question is: "Do you support the breeder who breeds hundreds of horses just to pick out the good ones and cash in the rest to the killer buyer?" The question is: "Do you support the person who uses the horse its whole life and when it gets to an old age sends it to slaughter as a thank you?" The question is: "Do you support the slaughter workers who cheer a horse on that struggles extra hard for its life?" The question is: "Do you support the killer buyer who not only buys up the strong, fat and healthy horses and leaves the meek weak and unhealthy for society, but also bids against the good homes and horse rescues?" The question is: "Can you see though the lies of the ones who stand to loose a buck with the end of horse slaughter?" The question is: "Do you support ripping the last of our wild horses away from their families and peaceful lives to be slaughtered?" The question is: "As a nation, can we allow this to continue and still call ourselves a civilized country?" The question is: "Can you look at the footage of innocent horses with their eyes gouged out, hooves ripped off, legs broken, beaten by the workers, faces smashed in from being on the transport trucks, horses stabbed in their spines, horses conscious for the entire killing process and do nothing?" That is the question, so what is YOUR answer? Please cosponsor S.727, this bill amends title 18 relating to the use of horses for human consumption (the ban on horse slaughter). Please cosponsor S.1579, this bill will give the wild horses some of their original protections back. Please make your calls to your elected officials, write, email, fax etc. 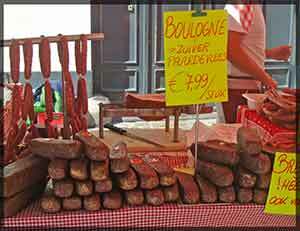 Horse salami at a market in Belgium. Picture Copyright 2009 Respect 4 Horses. 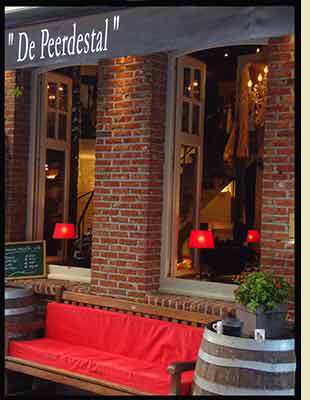 Belgian restaurant where horse meat is served.